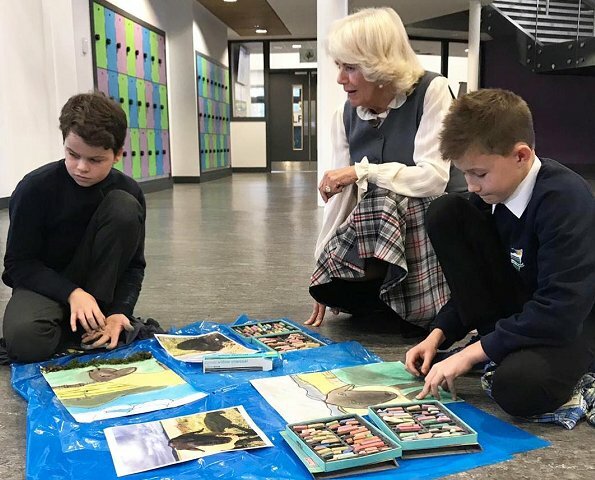 On October 11, 2018, The Duchess of Cornwall (She is referred to as the Duchess of Rothesay in Scotland) visited Alford Community Campus in Aberdeenshire, Scotland and met schoolchildren and teachers who use the centre. 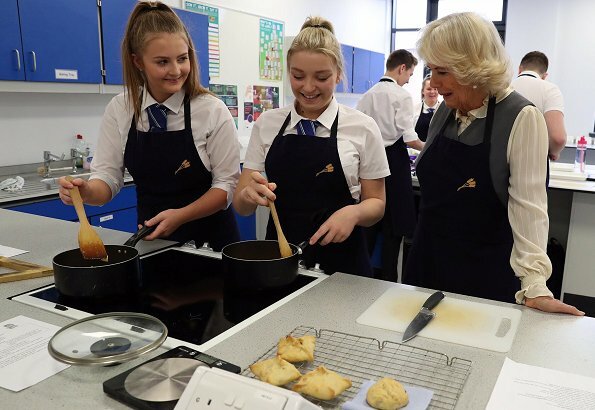 Duchess joined a cookery class in a home economics class at a campus. The campus offers facilities for the local community including a library, theatre, dance studio and swimming pool. Very nice outfit on Dss Camilla today gray red and white looks really elegant. Lovely outfit. Good balance of a traditional look with a little modern twist. She is also quite genuine, as far as I can tell. For the longest time I thought I would never warm up to Camilla. In fact i must say that I find her quite a strong person and certainly one who brought Charles a lot of happiness. Colors of the dress are not looking good with her hair and skin . She looks pale. So you know her personally? Lucky you....I would love to meet Camilla? Love her outfit. Her hair looks especially beautiful. In spite of the fact that this is a fashion blog..., I really wonder how many among the readers are able to look at this article without wondering why she stick to this engagement on the day of a family wedding??? Of course each family has its own delicate issues. Is that so? All about me and me would be to go to the wedding and cancel this appointment. This was a previous engagement - she didn't want to let them down. I fail to see how that makes it all about her. And frankly, if there are issues with other members of the family better that she sticks to her original longstanding engagement. Sometimes there really aren't any sinister reasons for why things happen, sometimes they really are just what people say they are - a calendar clash. must have been good ones to endure the scrutiny of the Media . they must have been compelling ones for her to endure the scrutiny of the Media . The dress is more for a young lady I think . 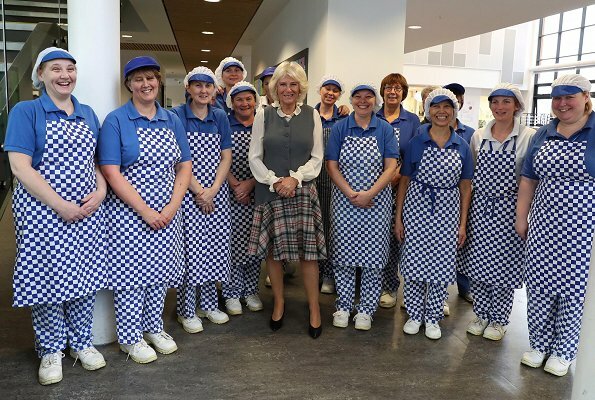 It looks like a school uniform.Camilla can do better. oh no! this is nothing like a younger look! 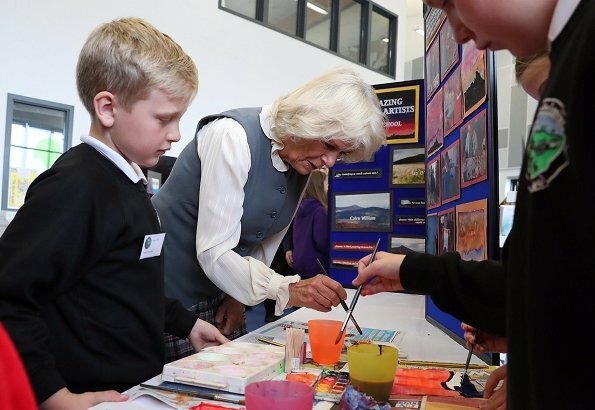 Camilla looks good - I like how she's paying tribute to the fact she's in Scotland. Like the slightly asymmetrical cut to the waistcoat. There are other "traditional" clothes that are more attractive than this ensemble. The vest is ugly and the skirt not flattering. 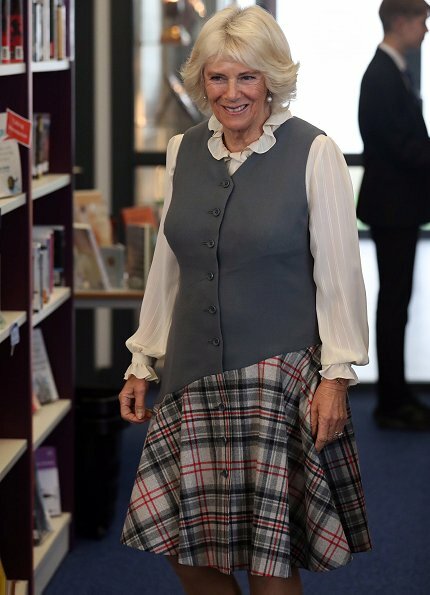 Me gusta el vestido de Camilla, está de acuerdo con Escocia que fino detalle!! I would like to suggest that if you notice that your message was repeated several times, you would take the initiative of DELETING those in excess. Thanks in advance. Make you press only once on "publish". But you would only notice if you go back after your comment has been approved. Sometimes my connection is slow so I think that the "publish" hasn't registered. So, really, how about just ignoring what is clearly just a mistake? Yes true, but always a good idea to go back to a posted comment.